Introducing a new feature series for the diggers out there; the ASIP Wantlist. We'll be asking friends and artists for the five records that sit at the top of their wish list, the records they make a beeline for every time they step into a record store, the covers they've never ran their finger across, the pieces of wax that long for a space on their shelf. Finding these elusive records has been made increasingly easier over the years with the likes of Discogs and eBay, but if you ask any record collector, nothing beats finding a piece of vinyl without the means of the internet; wrongly filed, turned backwards, hanging on to an original, busted sleeve, and inappropriately priced. The moment that goes through all of our heads; "is this it? Is it the original? Is it in OK condition? Yes! Why is it it filed in the Jazz section?? OK, how much is it..."
Some submissions in the series will undoubtedly be easily found on the internet, maybe at an extortionate black-market price, but this isn't just about highlighting the rarest LP's with only one acetate ever pressed. Instead, it's a personal love affair with a cherished format. It's a chance for the people who appreciate the physical product, to talk about the pieces they've wanted for some time, and the copies they long to find in a dusty old store - the earned find, not the one-click buy. Nothing beats it. Doing this was harder than I thought given how many sought-after records have been re-pressed recently, but I found this to be a proof point in why this feature could be interesting. It wont be a list to show-off peoples collections; "hey why don't you tell me about all those great records you have?" No. It will probably end up being a weird anomaly of records that unearth a bit of nostalgia and personality surrounding said person. I toyed with including some wants from my techno list, my trance list even, but ultimately settled on an ambient theme to begin proceedings. I'm yet to find a Gas vinyl in a record store and I don't own any Gas on vinyl. It kills me. And given the quality across his four albums between '96 and '00, any of them could be on this list. The grandfather of ambient techno (you could say) Wolfgang Voigt, released his defining self-titled LP on the just-as-legendary Mille Plateaux label in 1996 and has seen nothing but praise and imitators (in the good sense) ever since. His sound undoubtedly went on to influence his curations for Pop Ambient (this is where it started) and likely spawned a generation of washed-out, blissful techno music that straddled between ambient and dance-floor techno. Wolfgang is a big influence to many of the artists I listen to today and is responsible for Kompakt's infamous contribution to the ambient world, making his LP's top of my Wantlist by a long way. Perhaps an obvious choice, but I don't own many Slowdive records. I'm not sure if it's down to them generally being hard to come across; if I haven't had the urge to dig them out; or if deep down I can't even begin collecting Slowdive records properly until this one is in my collection (I'm an all-or-nothing type of person). Another shoegaze related want, with Chapterhouse receiving the remix treatment from Global Communication at the very beginning of their infamous ambient era. Tom Middleton and Mark Pritchard set the bar high in 1993 with this unexpected remix album, yet managed to better it even further with the release of their genre defining 76:14 album a year later. Whilst I'm lucky enough to own an original copy of 76:14, it's this remix album I'm on the hunt for now. Each track, taking the core of a Chapterhouse melody, feeling or vocal and capturing the very essence of Global Communication each and every time. This last one took me a while to think about. There's hundreds of older records I'm on the hunt for (which I'll no doubt have to cover in later features), but I wanted to provide variety across the five, so I looked to more recent 'misses' which are now on my hit-list. Alessandro Cortini (of Nine Inch Nails fame) has released three Forse albums and I unfortunately jumped on the bandwagon just a little too late, picking up the third (purple) last year. I now need to track down the previous two, because not only do I have an obsession with completing sets (for example, I'm still on the hunt for a few remaining Donnacha Costello Color Series 12"s and a couple more Pop Ambient LP's to complete those collections) but Alessandro's albums are similarly worthwhile collectors items. Beautifully presented, color vinyls, quality packaging and above all, include some powerful, stunning music by Alessandro and his synth-obsessed world. 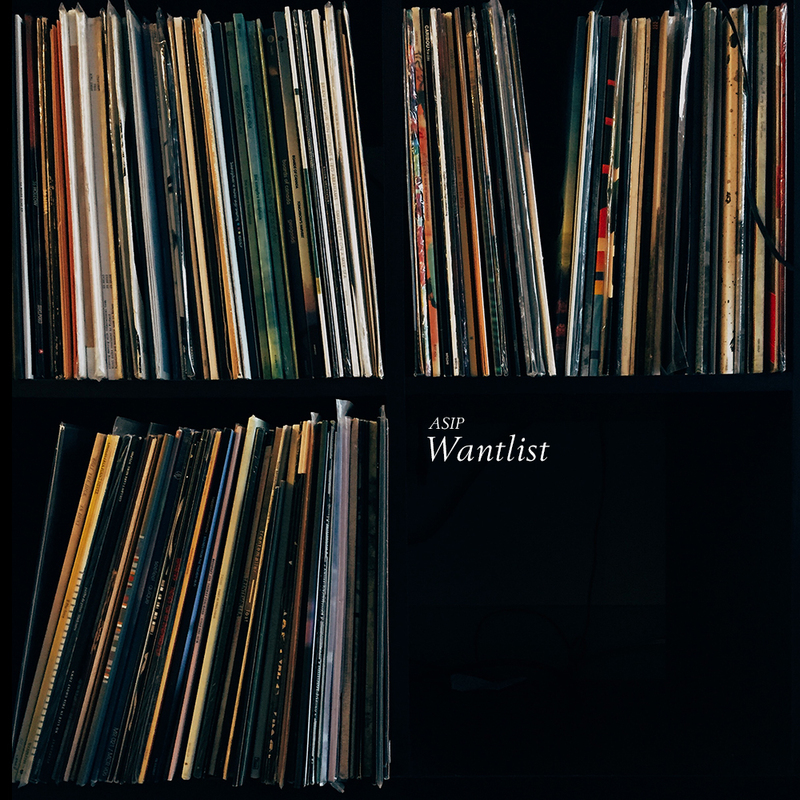 Wantlist #2 coming soon, featuring five selects from friend, Jamie Mccue of Silent Season.